C and I can sometimes be like Mr. and Mrs. Sprat when it comes to eating. C likes leaner cuts while I adore the fattier morsels. C hardly ventures past tomato-based pasta while I love olive oil based ones. I look forward to a good French toast or yogurt for breakfast while C prefers a more Filipino-style, rice and meat/fish dish for his morning meal. C does not really have a sweet tooth to speak of, and when he does he favors fruit filled desserts…while I am a solid chocolate girl. That being said, we also have a great deal in common food-wise. We love to experiment and try new dishes and ingredients. We love the gastronomic paradise that is Asian cuisine. We both agree that food is an essential part of travel. We both don’t fancy junk food too much. We love eating at home. You know, the important stuff. And, also very important (at least in my book), we both love spicy food. Our crisper is home to 2-3 different types of fresh chilies at any given point in time. Our pantry is stocked with dried chilies, chili flakes, and various hot sauces and chili pastes. Sriracha is one of our current favorites. It is incredibly versatile. It can be used as a condiment, say in a Vietnamese soup, as a dipping sauce, or even to top a burger. It also works beautifully in marinades or rubs. – Mix all the ingredients, except for the salt and pepper, in a bowl. Taste and adjust seasoning with salt if needed. – Pound your chicken fillets with a meat mallet (I do this in between 2 pieces of cling wrap to avoid bacterial chicken goo from splattering all over my kitchen) until they are of uniform thickness. 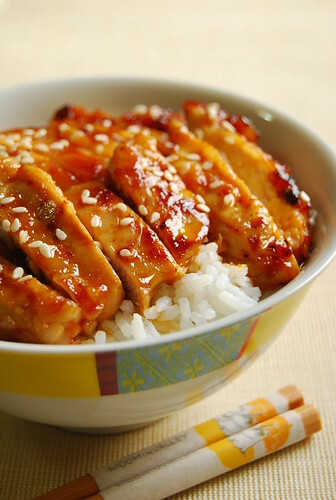 – Take a third of the marinade and pour this over your chicken pieces. Place in the fridge and let the chicken lay in its spicy bath for an hour or two. – Heat a few glugs of canola oil on a non-stick skillet. When the oil is hot, pan-fry the chicken until they are cooked and have acquired some nice caramelization around the edges, turning once. – Placed the cooked chicken on a chopping board and slice into strips. Lay on a bed of steaming white rice and sprinkle with sesame seeds (some chopped green onions would be good too but I didn’t have any!). This recipe makes about 2-3 portions of marinade, depending on how you use it. Stash the rest in the freezer for future use…you won’t regret it! For another meal, I used roughly 1/3 of the marinade on 3 pieces of chicken marylands (the leg and thigh together) which I then baked. You can also use it on chicken wings, which is I think is the most popular, or any other kind of chicken pieces you prefer. I’m thinking you could even try it on a whole roast chicken, basting with the extra marinade as it cooks. Or on a spatchcocked chicken on the grill (basting with extra marinade as well) if you are lucky enough to have a nice outdoor grilling space. I’m also itching to try it on some pork ribs! So you see, really versatile. If you’ve got some sitting smugly in your freezer, dinner will just be a matter of thawing and cooking. This recipe is cobbled together based on several I found online. You can even learn to make your own sriracha here. Hi The French! Isn’t such a great condiment to have? 🙂 Love it! Hi Wizzy! Me too…go spicy! Sriracha is a "must" in my pantry, too. I'll bet the pineapple/mango jam lends a lovely sticky-sweet taste and texture to these chicken thighs. Very nice! That looks great… Bring on the spicier foods. I've only recently discovered the joys of sriracha but have only used it as a condiment. I'll definitely be trying your chicken soon Jo – it sounds yummy. Hi Trissa! You can use it in a ton of things…hope you like it! Yum! Joey that looks fantaaastic! I so want a bottle of sriracha! now let me see which friend of mine is coming down.. I haven't ever seen any chicken prepare such a beautiful way Jo!!! That looks gloriously, deliciously incendiary, Joey! Never heard of Sriracha sauce before, but the chicken dish looks very attractive. May have to try with a more regular hot sauce perhaps..
Hi Purple Foodie! We are totally in love with it! Hi Sherry! Hope you guys like it! I can do this! and I totally agree with thigh fillets!!! I was never really into breast meat 😀 I know this is a Sriracha recipe but would you suggest a milder alternative to this so the kids can eat this as well? Wow, looks just like the takeout I get from a local restaurant. And such an easy recipe, too! i go for the thigh/dark meat too, it stays moist and i think it's more flavorful. sriracha is one of my top 5 favorite sauces (battling it out with cholula! )… tabasco being the first. i love it combined with hoisin for a dipping sauce. Oh that sounds sooooo good. Joey, I just made this for dinner tonight and it got two thumbs up from the hubby! : ) It was so good. I didn't have mango or pineapple jam so I used orange marmalade. I also had extra cilantro and threw it in the marinade. Yum! Thank you! I can't wait to do roasted marylands with the leftover marinade. That looks like a delicious dish! Hi Bordeaux! Sriracha always sounds good to me! I have been too lazy to post a comment, but I literally make this all the time. I always mix in a bag of spinach with it. Tonight I am replacing the chicken with tofu! You are awesome! I love this sweet and spicy recipe!